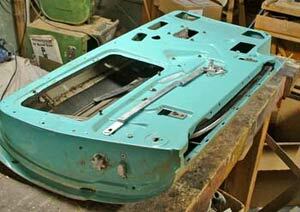 T-Bird Project — Part 16: Back to the Body! We last left off the details of bodywork a few months ago, and at that time the overall sheet metal activities were nearly done. All, that is, except the doors. 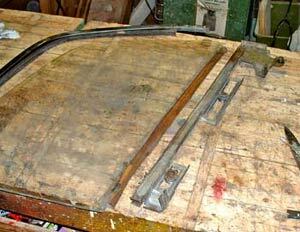 We didn't attack the doors until the rest of the body was reasonably straight, since they were very handy "in place." That is, while latched in place they served to help keep the body straight and gave us a good edge line with which to shape the door openings. Once all that was done, however, we needed to get the doors off and taken apart so that we could shape and prep them for final finishing. Removal was easy and we took the doors to the indoor workshop. 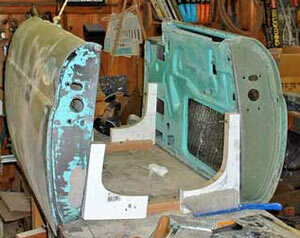 With the door laying on the bench we could start disassembly. The first thing to do was remove the windows. The rear (lock end) channel assembly was taken out by removing three screws, followed by removing the clips that secure the rollers in the other window channels. Being careful not to scratch the glass, we lifted out the windows and then removed the remaining tracks (marking them as to which door they fit.) 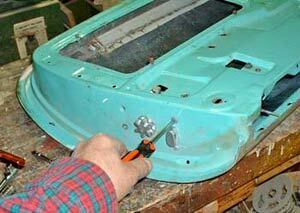 It was then easy to remove the crank assembly, door lock and handles. 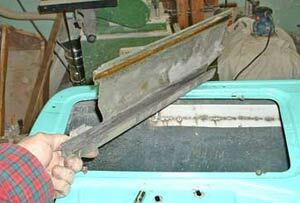 The rear channel comes out the big hole in the side of the door. The securing clip pops right out, so watch where it lands on the floor! 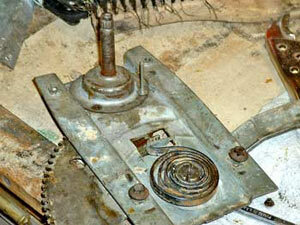 The door lock assembly is held with four screws. The window mechanism looks complicated, but it really isn't. Don't be afraid of it. The next step was paint stripping. 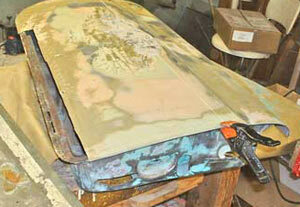 We wanted to get the outer skins and sides completely down to bare metal to see what needed to be repaired or replaced. 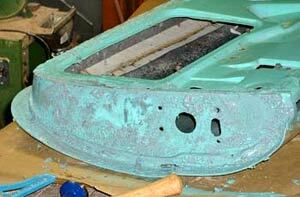 Once done, we found serious rust on the bottom of both outer skins. 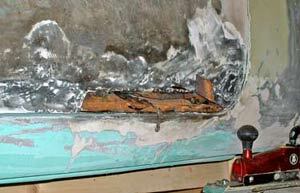 The rust wasn't bad enough to require replacement, but some new metal would have to be shaped and welded in. More chemical stripper, more scrubbing! 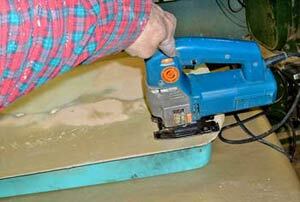 The best tool for straight cutting is the jigsaw with a metal-cutting blade. It looks worse than it is, but it needs attention. 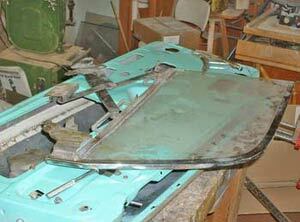 When we finished cutting we had a narrow area of door skin to replace, which meant some cutting, shaping and welding. After cutting some 20-gauge sheet metal we bent a lip for the bottom and made our measurements. Trial and error were the keys here, and eventually we had our acceptable fit. Once we were satisfied with our fit we tacked the patch into place and made some surface measurements to make sure the skin was conforming to curvature. The sheet metal is going into place for its first fitting. 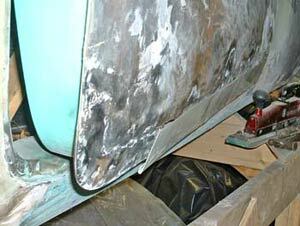 Note the previously welded repair on the left end of the door skin. When we were finished the metalwork we took the time to build a fixture on our workbench that would hold the doors in vertical position. We didn't have to do this, but felt that the effort was worth it. With the doors in their "as-in-the-car" positions we would be better able to see minor surface irregularities during the body filler applications. The doors are sitting verical. The one on the right is stripped and sprayed with etching primer, while the one on the left still needs some stripping. You can see real progress on this door. The weld lines are ground and filled and the surface is beginning to look smooth. While waiting for various applications of filler to cure we turned our attention to the window and lock hardware. Rather than throw everything in a box — where it would be forgotten until needed — we decided to repair the parts before storing them away. The door lock assemblies were in great condition (probably replaced some years ago) and only needed cleaning and lubrication. One window crank was skipping and the other was quite stiff, so we took them apart. 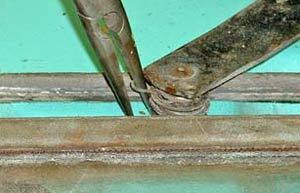 The window crank assembly with its mounting plate, foreground, removed. After removing the stop-screw on the geared segment wheel we were able to get the wheel away from its crank mechanism. 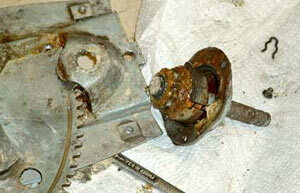 This allowed us to remove the crank and inspect its teeth for wear. 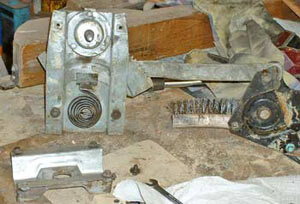 Once we cleaned everything we discovered that the crank's teeth were in excellent condition. All that had happened is that the hardened grease had moved the entire assembly sideways enough to cause misalignment with the mating segment wheel. 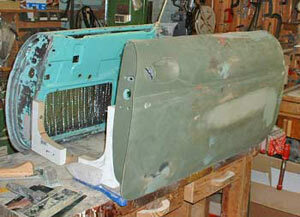 Proper fitting, lubrication and new rivets were installed to renew the assembly. The crank looks horrible, but it's mostly hardened grease. The rivets are going in prior to a final test. Everything was cleaned after testing and re-lubricated. Any rusted areas were painted with a brush (no need to be beautiful here) and then all the parts were marked and stowed away in plastic bags. 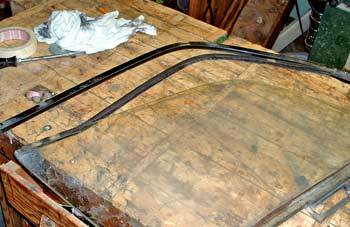 We also took apart the window frames and renewed the sealing material around the glass, as well as cleaned and repaired the channel assemblies. We wrote about removing the window glass in a Beginners' Corner article a couple months ago (see link below), so we won't repeat ourselves here. However, we will mention that we made sure the rollers and other components were working perfectly before reinstalling the glass and chrome trim. The glass is coming out of the frame. The parts are ready for repair and lubrication. Before replacing the chrome trim we buffed it smooth on our wheels to remove any scratches and stains from years of neglect. Once the windows were reassembled we wrapped each one in cardboard to keep them from breakage during storage.